Despite the industry being in a state of post-revolution following the onset and adoption of machinery, there is a batch of technologies that already define the state of technological innovation in agriculture. The agricultural sector is in the middle of the data-driven transformation. Farmers and commodity traders are heading towards technological innovation in agriculture, adopting data analytics and smart farming technologies. Facing a crucial period in their history, agricultural businesses are tasked with combating the issues that will change not only their working methods but the world as we know it. One of the greatest pain points associated with agriculture is the ability to predict the events that will achieve a given result. Conditions play even less in the favour of farms positioned within markets that face rising production costs. The global population reaching 9.6 billion people by 2050, up from around 7 billion at present, according to forecasts from the United Nations, combined with the spread of economic prosperity are adding great pressure to the market. The UN suggests the doubling of crop production by 2050 as a countermeasure to this growth. Some farmers simply cannot increase their land in order to grow more crops. As a result, there is a case for technology to make better use of the space available. To become more efficient, agricultural businesses need data and plenty of it. This opens the door for technological innovation, as the size of these businesses and their plots of land prevent any kind of manual surveying. Already we are seeing an active use of IoT devices to analyse the status of crops, capturing real-time data with sensors. For instance, with soil sensors, farmers can detect any irregular conditions such as high acidity and efficiently tackle these issues to improve their yield. The data gathered from sensors allows to apply advanced analytics and get the insight that aid decisions around harvesting, while machine learning can transform the figures into solid predictions. Using advanced analytics, agricultural businesses can forecast yields, foresee unexpected weather conditions, predict market demand and mitigate risks, as well as better plan their capacity. Agricultural drone is also among the key components of smart farming today. Tasked with the surveying of crop and livestock conditions from up high, their use of time lapsing within onboard cameras is helping farmers identify problems in areas like irrigation, which would otherwise go undetected. Other members of the drone family allow for the spraying of crops at a greater accuracy than a tractor. As an added benefit, this also seeks to reduce the risk of human exposure to harmful chemicals. Back to ground level, there is potential for other robots to help out with manual duties like planting, ploughing and meat production. The end goal in this case? A more efficient, more effective farm. To spell things out: population growth could mean that every agricultural business will have to increase their levels of productivity over the next 30 years. That said, a review of the tech on today’s market suggests even the most specific problems can be matched with smart agribusiness solutions. In the era of smart agriculture, IoT and predictive analytics are powering more efficient operations around the world. Combining IoT with analytics, agribusinesses get accurate predictions for crops and market conditions, allowing to increase their yields and profits. Smart application of technologies can facilitate warehouse and inventory management, help plan and execute seasonal works with the automated flow of data from the fields and agro-research labs. Get in touch to discuss where the IoT can help futureproof your own agricultural business. At ELEKS, we run several R&D projects related to IoT, drones and other smart devices. Over the course of these projects, we discovered that there are some tasks that are common for different devices and platforms. Our team has substantial experience with complex enterprise solutions, so when our partners from Cisco Systems suggested that we apply our expertise to IoT and create a framework for IoT solutions, we gladly joined the project. Currently, there are a lot of IoT tools and solutions (as much as 35 are mentioned in this single article), so why should we create something new? The majority of the existing frameworks focus on programming and controlling separate devices. Yet, we aimed to develop a solution that would allow programming complex systems consisting of multiple devices that interact with each other. We saw that the majority of requirements could be implemented with Akka. To understand the problems we wanted to solve with Pragmukko, let’s look at the hypothetical business case that can become a commonplace occurrence in the very near future. Assume we have several drones controlled by Raspberry Pi, a regular PC as a control station and a smart fridge with ice cream controlled by Intel Edison. All the devices are physically located in one room and are connected to one and the same network via Wi-Fi. A drone has to pick up and deliver some ice cream from the fridge when a user orders it to do so. Therefore, the framework’s main goal is to enable easy programming of this function. Since the project team decided to use Akka, our first idea was to launch an Akka node on every component of our system: drones, control station and fridge, and then build the logic of every component as an actor in the node. This way, our system would look like a regular Akka cluster with some nodes capable of flying and other being fridges with ice cream. Akka enables the drones, the fridge and the control station to communicate with each other, control the state of the cluster, receive the list of the cluster members, etc. Under certain conditions, our system is decentralized and resistant to the failure of individual components. Moreover, we can easily add new components to the cluster – they will immediately get the information about other members and join the operation. This means that we can effortlessly install one more fridge, or, if any drone takes too much ice cream and falls down, we can employ additional drones. In general, we had to write a hardware interaction layer and bring the whole IoT and drones thing together. That’s what we did, along with some other things. To bring the system to life, the team took the following steps. First of all, we created a mechanism to automatically group the nodes in a cluster. Although Akka has this function, we ignored it because it required preliminary configuration of seed nodes. We also needed to know the network addresses of all cluster members, and these were the kind of complications we wanted to avoid. Instead, the project team developed the node grouping mechanism based on UDP broadcasting. 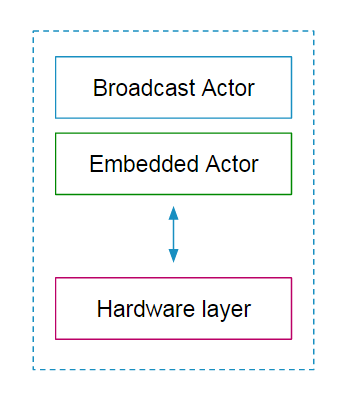 Broadcast Actor is an actor that sends UDP-broadcast messages for the node to be identified and added to the cluster. Embedded Actor is an actor that processes the messages from other nodes of the cluster and interacts with hardware. This actor can be extended to implement user logic. Hardware Layer is the layer for hardware interaction. It is an actor that receives binary commands and writes them to the serial port. 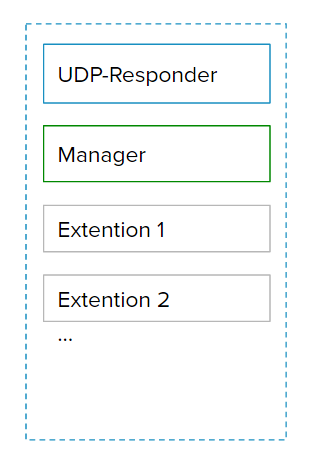 UDP-Responder is an actor that adds new nodes to the cluster. Unfortunately, the project team was unable to implement the business case described above since there’s no fridge with ice cream in our office. Therefore, we tested a simplified case. We had several quadcopters randomly flying over a certain territory. They were controlled by the control station that kept them inside the perimeter. 10 if (position.x > 10 || position.x < -10) sender() ! "turn x"
11 if (position.y > 10 || position.y < -10) sender() ! "turn y"
Basically, that’s all with the code. We compiled it and launched the Embedded Node on the drone. As for the control station, it can be launched anywhere: for instance on a laptop, provided that it is located in the same network with drones. So, what’s happening behind the scenes? A drone, when launched, starts identifying itself with broadcast messages. As soon as a control station gets the message, it adds the drone to a cluster. Finding itself in the cluster, the drone adds the control station to the context.listeners list. The control station and the drone’s Embedded Node implement the trait DroneCommands. This trait contains utilities for Pixhawk MAVLink protocol. For example, direction(dx:Float, dy:Float, dz:Float) method forms a binary command that sets the drone speed along certain axes. All incoming binary commands are automatically transmitted to the hardware interaction layer that communicates with the drone’s autopilot. Since we implemented the hardware interaction layer as a simple interface to the serial port, other autopilots would work if you change the implementation of DroneCommands. Here are a few more words about the deployment. As the number of drones and IoT devices we experimented with grew bigger, the time to deploy them also increased. We had to go through the same routine for each device: install Java, upload the app, register it as daemon, and reboot the device. Only after all these steps could we deploy the Manage Node with all the components it interacted with. The process was so complicated that the team immediately wanted to automate it. 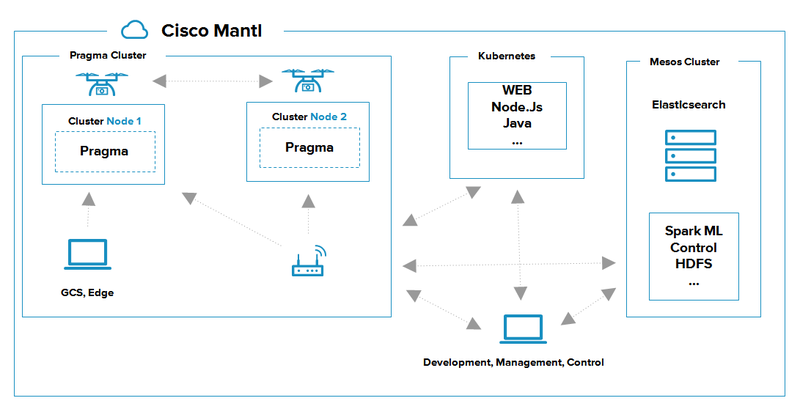 On the advice of our partners from Cisco, we used Mantl.io. A platform for rapidly deploying globally distributed services, Mantl provides all the necessary components to start fast and improve often. As Cisco’s CTO Zorawar Biri Singh outlines in his exclusive interview to InfoWorld, in the foreseeable future, this lightweight, high-level container PaaS can be used as an orchestrator solution for building tightly coupled systems. With just a few Ansible scripts, we were capable of deploying the necessary infrastructure, regardless of the number of devices in it. The team really loved this method and, as a result, we highly recommend it. The characteristics might look quite impressive, but alongside our process, this mini computer also has to run two important processes with nearly real-time priorities. To prevent our software from inhibiting the neighbouring processes, we limited the CPU usage for it to a single core. Additionally, we set one more limitation: the use of memory by the Java process was restricted by the -Xmx32m parameter. Before the test flight, the team decided to check how our Embedded Node would work on Raspberry Pi with such limitations. Once launched, the process immediately utilised 25% CPU (100% according to top data), or just one core out of four, and in a couple of seconds the CPU use dropped down to an acceptable 10-15%. The memory showed even better results: the process did not utilize all of the allocated 32 Mb, and the garbage collector was starting after a time-out. During the flight, the performance parameters declined. CPU use reached 20% and the garbage collector worked intensely, because the autopilot generated a lot of telemetry data. If necessary, there is some possibility for optimization by limiting the telemetry stream only to autopilot configuration. We did not introduce such limitations because the parameters were within the normal range and the software did its job well – the control station directed the drone and kept it within the designated perimeter. The project also revealed a number of challenges we still have to overcome. In particular, the higher the drone’s speed, the harder it is to control it. This is a complex problem and our framework cannot take all the blame for it. The control scheme that we used in the experiment is hardly suitable for real tasks. 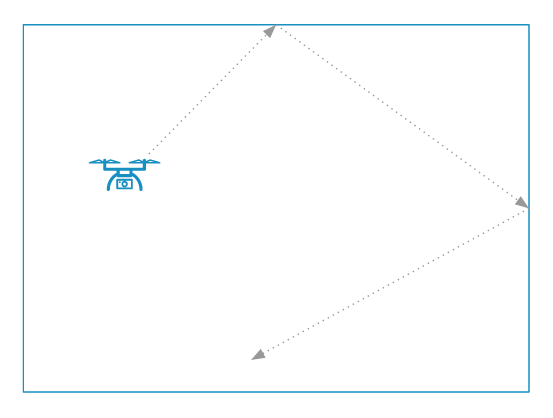 We can feed the drone the destination coordinates instead of the velocity vectors. Such an approach will add accuracy to the drone positioning, offsetting the dependance on the data link between the drone and the control station. The second problem is the insufficient speed of our software. Akka is very slow to start. If the actor system is launched, joining the cluster takes from 5 to 20 seconds. Primarily, the speed depends on the quality of the network connection. We still work to improve this aspect. Another interesting feature of Pragmukko is the possibility to emulate hardware cluster members. This can come in handy while testing the business logic that is implemented on the devices. To enable hardware emulation, we extended the framework with the possibility of switching the Hardware Interaction Layer to Mock. For the tests, we saved real telemetry in a file and then ran its instances on the Embedded Node. I can already see how we will run integration tests for our drones on Jenkins. Then, the expression “the tests have crashed” will not be nearly as dramatic as it is now. Follow the link to learn more about Pragmukko, its features and the project roadmap. Pragmukko makes the system easy to program, configure and test. In spite of certain complications, we are satisfied with the result. We also believe that our framework has a potential for a widespread use. I thank all of you who have read up to these lines. No drone was harmed in the making of this experiment.